I’m here to introduce the first of our two new patterns for fall 2015. Today I’ll focus on Lisette B6244 for Butterick, which includes two pieces: a classic dress with a little twist, and an elegant drapey coat. 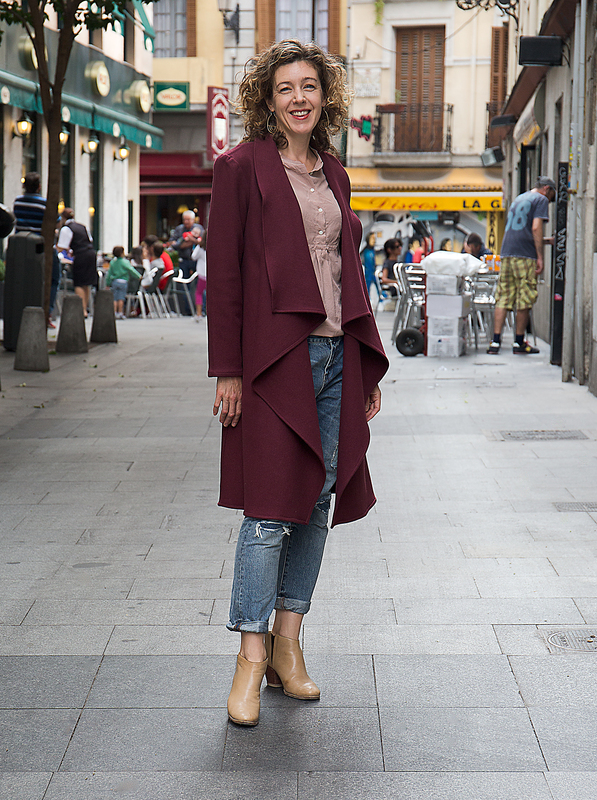 Don’t miss the video of the coat near the end of this post! I love a classic silhouette with a little twist that makes it special. In the case of the dress, the silhouette is a feminine, fitted bodice with an A-line skirt: the dress that flatters pretty much every body shape. The added special detail is what I call the multimedia effect. It’s a bit difficult to see in these photos, but the side panels and shoulder yokes can be made with a contrasting or complimenting fabric. In the case of the dress on the pattern cover and in these photos, we chose a classic tartan and used a faux leather for the contrast panels. I’m a little obsessed with the faux leather right now; it’s inexpensive, easy to work with, comfortable to wear, you name it. But you could also use lace, a solid color, or a contrasting print as your second fabric. I’m excited to sew and wear this style as soon as I find time and fabric. (I loved the tartan so much I may need to make myself the same dress!) I hope you’ll like this style as well. I think it’s the sort of dress that’s perfect for work, but you can also dress it down with boots and a denim jacket. Layer it for cooler weather (thus the coat, which I’ll talk about next), and the short sleeves will let you wear it all fall and next spring as well. Next, the coat: I can tell you that this pattern is a really quick and easy make. It has only three pattern pieces: front, back, and sleeves. No lining or facings, no separate collar, just three straightforward pattern pieces. It’s a very clean and straightforward design. It’s sort of a cross between a winter coat and a comfortable cardigan; I’ll wear it on cold but not completely freezing days, and I think it will be really cozy. For me, it’s the coat I never have in my closet: the one that splits the difference between a heavy winter coat and a spring jacket. If you sew it from double-faced wool or wool/cashmere (which is what I really wanted to do until I fell in love with the burgundy wool you’ll see me wearing below) it may even be warm enough for the really, really cold days of winter. What I love about this coat: its utter simplicity. I love architectural influences in fashion, and for me this is that sort of coat. The draped front occurs naturally when the front panel hangs from the shoulders, and the collar is formed with a simple dart and a neck seam. I think we’ll do a sew-along for this one, just to show you how incredibly easy it is to sew. You probably won’t need it, however. Each seam is finished with a flat felled seam so the inside of the coat is just as clean and finished as the outside. But I’ve already said enough. How about a video so you can see how the coat moves? And here are more photos. As you can see, the coat works just as well with casual clothes as it does with dressy. I wear jeans a lot during the fall and winter, and I’m pretty excited by how the coat looks with them. So that’s B6244, and I hope you’ll love it! I think both patterns work really well as core pieces in a wardrobe. I didn’t pack many clothes for our time abroad, but I know I’ll be wearing the coat a lot this fall and winter. And the dress is on my To Make list as soon as I have time to sew it. I hope you’ll show us how you sew these pieces for your own wardrobe! Post your photos to our SewLisette Flickr group or tag them #sewlisette and #B6244 on Instagram so we can find them, OK? How do I pick a size for the coat that will fit me? The dress in a 12 will fit me but the 12 for the coat seems too big. If you go by the measurement chart on the pattern you will be fine. The coat has a very full cut. Hi, I cutted my fabric, but I am not able to put front and back together. Back seems to be too large to fit to front..
Hi, so excited to find this web site. I love Butterick patterns. So easy to follow and patterns always fit nice. I bought the pattern B6244 and was excited to make it with some grey wool that I have. Cut all of the pattern, sewing it together, but I am really struggling to construct the neck with the shoulders and finish it neatly with the flat fell seam. Can you please do a sew-along for this pattern and please let me know when this is going to happen as I have an unfinished coat, which is a shame as I really want to wear it.